National Development and Reform Commission role (state planning body) may include membership of the Tibet Work Leading Group. Education: A “sent-down” youth. Later studied finance at Xiamen University school of economics. Went on to pursue a master’s degree. 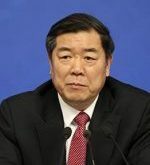 Career: Most of his career has been in Fujian and Tianjin, rising to Party Secretary of Fuzhou. Has been a Deputy Director of the National Development and Reform Commission since 2014 and took the top position in 2017. Prospects: Member of the CCP 19th Central Committee. Future prospects for promotion unclear. Relevance to Tibet: May join the reconstituted Tibet Work Leading Group. This is “mini” profile. See information above right.